30 Days Of Whole30 Meals - Welcome to SarahKesseli.com! Want to know how I survived my Whole30 adventures? With a few key ingredients, a bit of planning, a whole bunch of simplicity and tons of tasty Whole30 meals! I survived! Yes, I did! If you read my post on 5 Things I Learned From Doing Whole30, then you have already seen quite a few of my Whole30 meals and have some insight into how the 30 days went for me! If you haven’t read it yet, I suggest reading it HERE first before diving into the food! When I finally committed to a date to start Whole30, I knew I needed to go into those 30 days with a plan, so I didn’t get bored! Brat Hans chicken sausages ahi tuna (this was a splurge for me!). Next up was deciding what fresh veggies and fruits I wanted to have on hand. I chose things that I could quickly #MealPrep on Sunday to ensure that the week was easy, and my meals were still delicious! *These items were used only on a very rare occasion when I needed something quick for a day out or a road snack. Whole30 advises that bars, etc. be used only in cases of emergency. After my initial haul, the only items I needed to restock were my fresh fruits and veggies, which I was able to do bi-weekly. So, now I am sure you are wondering, what the heck did I do with all of these items? Are you ready? 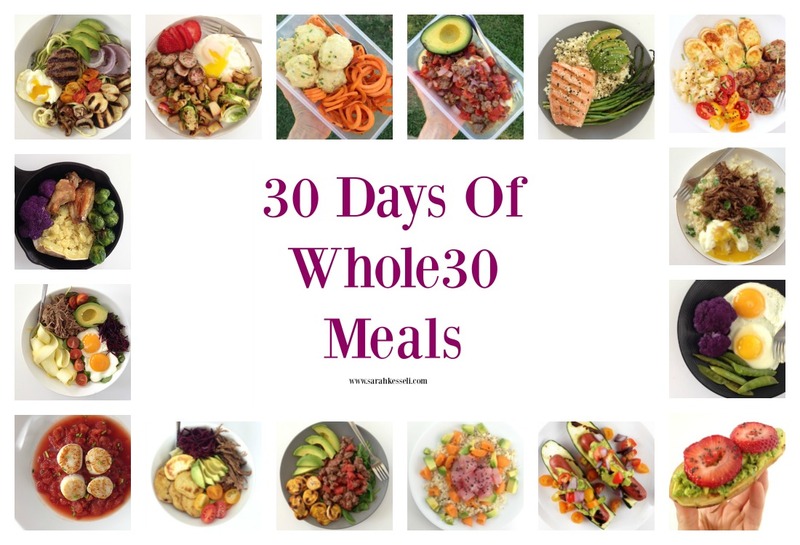 Here are 30 days of Whole30 meals! 30 breakfast, 30 lunch and 30 dinner! a.k.a – my favorite meal of the day! WOW!!! Looking at all of that food amazes me and reminds me of how many cold meals I ate just to make sure I got a picture of it for you! 😉 Do you still want all the meal details? Make sure to subscribe to my newsletter to receive the “30 Days Of Whole30 Meals” eBook! The eBook is complete with all foods listed for each of the 90 meals shown above plus includes the products and brands used! Talk to me! Have you ever done a Whole30 before? Do you think you would do one? If you are on the fence and still need more recipe inspiration, check out my Whole30 Pinterest board with even more mouthwatering ideas! And if you aren’t planning on doing a Whole30, but still want some tasty inspiration, I’ve got tons HERE and HERE!! Check it out!